I've been an active volunteer and supporter of Habitat for Humanity for a long time. Since participating on a post-tsunami international Habitat build in Sri Lanka in Summer 2005, I've become heavily engaged in supporting Austin Habitat for Humanity, including volunteering, fundraising, and board service. Many of you have asked over the years how you might be able to support Austin Habitat for Humanity's mission of eliminating poverty housing in Austin. 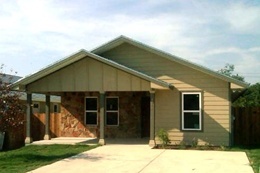 One great way to support Austin Habitat is to support our 2011 Board Build. I'm happy to report that the board has committed to fundraise for and build a Habitat home again this year. I am currently raising funds to assist in the building of the board home and hope that you will consider contributing to our efforts. I will be building the Board of Directors Habitat house on Saturday, May 14th (from 8:00 - 3:30 pm) so I also invite you to come build with me and share in the Habitat experience.